Matsuo Basho is buried at the Temple at Otsu, Shiga, Japan. 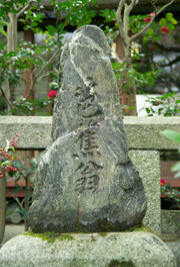 He was born in Iga-ueno near Kyoto in 1644 and at a early age entered the service of the samurai Todo Yoshitada. During this time he began to write poetry and in particular hokku or haiku - miniature poems comprising of seventeen syllables. After Yoshitada's death in 1666 it is likely that Basho moved to Kyoto. By 1672 he had moved to Edo (modern day Tokyo) where he continued to pursue his writing and also taught haiku and judged haiku competitions. It was here that he had the first of his three huts in a remote location near the Sumida River. night my basin echoes rain. Basho's work was heavily influenced by Zen Buddhism. In particular, by karumi which literally means 'lightness'. He famously declared that: 'a good poem is one in which the form of the verse and the joining of its parts seem light as a shallow river flowing over its sandy bed.' He was also inspired by the Zen doctrines of non-attachment and of oneness with nature. Through out his life Basho was a compulsive traveller - often wandering for months on the perilous Japanese roads with little food or money - relying on the hospitality of Zen temples or fellow poets. He wrote a number of haibun (prose followed by haiku) about his travels including: The Records of a Weather-Exposed Skeleton (1684-8), A Visit to Kashima Shrine (1687), The Records of a Travel-Worn Satchel ( 1688) and The Narrow Road to the North (1689). However, it is for his haiku that he will be chiefly remembered. He rose above the artificiality of previous haiku poets and frequently succeeded in capturing enchanting, timeless moments.